Google's first campus in San Jose may not be what you expect. Yes, they have been working for ages on a transit-oriented urban campus centered around Diridon Station in Downtown San Jose. That campus will eventually house tens of thousands of employees across a staggering 8 million SQFT of office space. However, one of their first forays into San Jose is going to be a bit more modest than that. 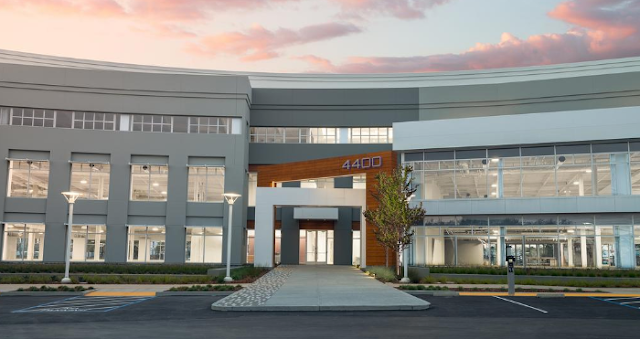 Google has just acquired two office buildings in North San Jose at 4300 and 4400 North First Street. The buildings are just north of Highway 237, which I would consider to be Alviso. The buildings are partially occupied by Harmonic and Compstak and have recently been renovated. The leases expire in 2020, which is only a little over a year away. Their intentions for the buildings are not yet clear, but this seems like an obvious extension of their Mountain View campus, which is only 8 miles away by car or a 45 minute bike ride away.